The importance of visualising and analysing online customer feedback cannot be emphasised enough. A very modern approach to data analysis, using visualisations not only enables us to easily digest the data but also aids in extracting valuable customer insights. And as feedback volumes rise, visualisation tools such as dashboards become increasingly advantageous. There are many feedback tools that do not offer dashboards or analysis capabilities within their software. And regrettably, as a result, most of the feedback ends up in an Excel spreadsheet. Now don’t get me wrong, Excel is certainly useful in many different ways, but analysing large volumes of feedback and having to calculate metrics such as NPS or Csat? I wouldn’t say it’s the most practical of solutions. Just think about how much time and effort manually exporting feedback data on a daily or weekly basis will cost you. And what about when open-ended comments become a part of the equation? On the other hand, there are feedback tools out there that do indeed offer dashboards. However these are often pre-defined dashboards, which can be very limiting. For example, these dashboards display measurements such as the total amount of feedback collected or count the number of smileys or stars that you’ve collected on your website, all within a fixed time period. Mopinion has a solution that will put all of these issues to rest. With Mopinion’s feedback analytics software, you can completely customise your dashboards based on your needs and priorities. Additionally, data can be displayed in real-time meaning you can see the latest feedback visualised in your dashboards right then and there, giving you a head start on taking action. So how can you get started with building your own dashboards? For obvious reasons you cannot build a dashboard without feedback data. You will need to have a data source in place, whether that may be a tool that collects or has collected feedback data. 1. Online feedback forms: These are feedback forms that are built into the Mopinion platform. Using these forms, feedback is collected in real-time and therefore, directly available for further analysis. 2. Imported feedback via CSV or XLS: This is feedback data that is collected using an external feedback or survey tool. This known as the Data Loader in Mopinion’s software. Read more about this feature here. 3. 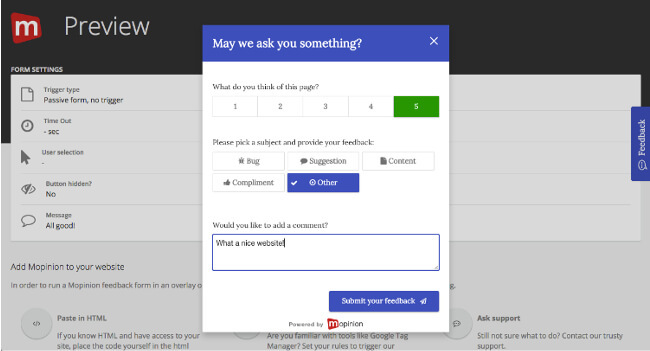 Feedback and survey tool integrations: These are external feedback tools that are directly connected to the Mopinion platform via API connectors. Note: It is important to keep in mind that feedback comes in all different shapes and sizes. Many data variables should be considered including scores, such as Net Promoter Score or Customer Effort Score, browser type, URL, open comments, etc. Now that you are familiar with the different types of data sources, let’s take a closer look at the types of feedback data that stem from these data sources. 1. Scores (Csat, CES, NPS): Each score has its own calculation method. For example, NPS, which presents the percentage of promoters and detractors, is calculated in a completely different way than a Csat score, which is more or less an average ranking between 1 and 10. 2. Categories: This includes pre-categorised feedback data that stems from closed feedback questions, such as input from drop down selection lists, radio buttons, or multiple choice questions. Feedback categories are used quite often. Example: “Please select your feedback category” (Options include: Bug, compliment, suggestions, etc.). 3. Open-ended text: These are feedback comments that have been collected within the text areas of a form or survey. However, this also includes single line text fields for short, open-ended questions. Example: “What is your favorite color”? 4. Customer / contact data: This includes names, email addresses, gender, etc. 5. Images: This is for tools that render screenshots when a user gives feedback. 6. Metadata: Feedback that is collected, but not explicitly requested of the visitor/customer. This includes data such as the URL where feedback was collected from, as well as browser type, device, or operating system (OS). This is key data for identifying a technical error. 7. Date: Knowing the date the feedback was submitted is also quite handy. Especially in cases where you want to analyse trends over time. As you can see, there are many different types of feedback data. So what is the most coherent way of visualising these data variables in your dashboard? Mopinion’s dashboard is made up of panels. In the panel, you can add templates, which consist of pre-built charts (including trend lines, bar graphs, etc.) and widgets (e.g. to show a single calculated score). These panels enable you to visualise your feedback data in a way that suits your needs. For example, you can rearrange your data so that the most important KPIs are on the top row. In our platform, when you click on the “Build new chart” button, you will be presented with two options, either choose from a selection of pre-built charts or build a chart from scratch. If you’re a beginner, go easy on yourself and choose the pre-built chart templates. As previously mentioned in this blog, there are a number of data sources you can choose from. You can either select data from our online feedback forms or from imported/synced datasets. Within each of these sources you can see which data types are available. The different types of data were also previously mentioned. These are items like scores/metrics, open-ended text, categorised data, or metadata (e.g. browser type or device). Note (above): the Excel icon indicates that it is imported feedback data. The questionnaire icon indicates that the feedback data is from a Mopinion Feedback Form. Step 3: Time to pick your template! Depending on the feedback type or question you have selected, the system will automatically render all available charts for that type of data. Select which chart you would like to use to visualise your data and add it to your dashboard. Note: these charts can be distributed per day, week, month or even year. My next blog will be one for the pros. I will explain how to build your own user feedback dashboards from scratch. Stay tuned! Is digital development on the rise for B2B companies?